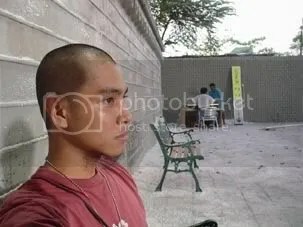 here’s a picture of me taken last thursday (feb 18) while on a break during a shoot at our garden studio in mandaluyong. the wall behind me was built, which i supervised, for the shoot. it was a replica of a real wall found in korea, and this was made out of plywood, styrofoam, and painted in cement. eto trabaho ko. astig. that’s rajie at the far end and another carpenter, working on a signage props for this shoot. he’s the head setman/ artist of my boss (dante mendoza). he’s muslim and that has brought a particular connection of understanding between us, natives from native mindanao. originally my boss thought i was muslim also, seeing that rajie and i spoke the same language at times and we seem to understand each other clearly. that and the fact that i sport a billy goat’s goatee and a tubao or an arabian’s headgear (yung red!). he’s also deaf in one ear and we have to either talk out loud in front of him or speak clearly in his good ear.